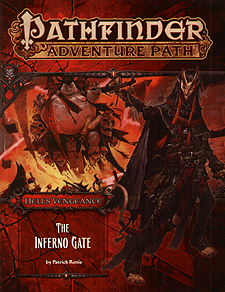 The Thrice-Damned House of Thrune wants to seal the Inferno Gate, an uncontrolled portal to Hell, and the villainous adventurers are called to accomplish the task. To acquire the components and perform the ritual, they must first face down a hellspawn thieves' guild, the Hellknight Order of the Pike, and the knights of the Glorious Reclamation and their celestial allies. But before they can complete the ritual, the characters may be forced to examine their options - is closing the gate the best plan for the future? Will the villains obey their order to close the gate to Hell - or might they make a deal with a devil for control of the portal? Or will they only become the latest in a long line of sacrifices to the Inferno Gate? A foray into the faith of the archdevil Moloch, by F Wesley Schneider. Details on various types of magical portals, by F Wesley Schneider. A last-second rescue reveals ban unexpected ally in the Pathfinder's Journal, by Josh Vogt.